FRANKFURT (Bloomberg) --Ford Motor Co., said European sales in December dropped 23 percent as the region's market shrank and other manufacturers offered “unprecedented” rebates to lure buyers. Registrations in Ford's 19 main markets in Europe fell to 84,400, the company's Cologne, Germany-based regional division said in a statement. For the full year, registrations sank 11 percent to 1.28 million vehicles and market share declined 0.7 percentage points to 8.4 percent. 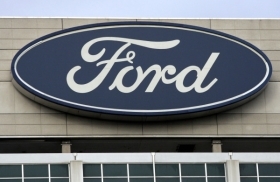 Ford said it maintained its No. 2 position in Europe for a third straight year. The region's car market declined more than half a million units to 15.3 million, Ford said, forecasting it will be in the range of 14.5 million to 15.5 million units this year. Government incentives elapsed and budget cuts in European countries including Spain and Greece discouraged potential customers from buying a new car last year. Ford has begun selling a new version of its C-MAX wagon and will offer an overhauled version of the Focus compact in the first quarter. It said it's introducing “at least 20 new products and derivatives” in Europe in the next three years. Ford won't “undermine our fundamentally efficient and strong business by buying share or volume through widespread and excessive incentives that can damage residual values and brand image,” Odell said.